I found the cutest giveaway and had to share! 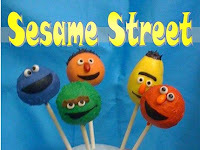 Jenna over at Momma Told Me is hosting a giveaway for 12 Sesame Street Lolly Pops by Cake Pop Castle. You can find the giveaway here. I would love to win these but if I don't (dare I say that!) I would love to buy the lolly pops and make a cake for them to go on for my little guys birthday! Its not for a few months but this would be a great idea. He LOVES Sesame Street! His favorite song is the "5 Fruits & Vegetables" he shrieks when he hears it! His other is the hilarious song "Cookies are a Sometimes Food" by cookie monster. Those are TOO cute! I love the idea about putting them on a cake... although I do have to wonder if kids would be a little freaked out by biting into Elmo's head? They're adorable! 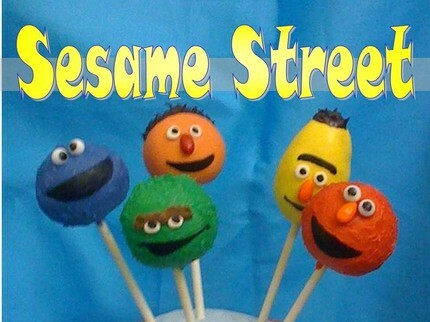 I was introduced to cake pops by Bakerella.com a few years ago, she has done some really cute ones! Check out her blog if you want to see some awesome baked goods, LOL. Anyway, I am following you back from pitchit!